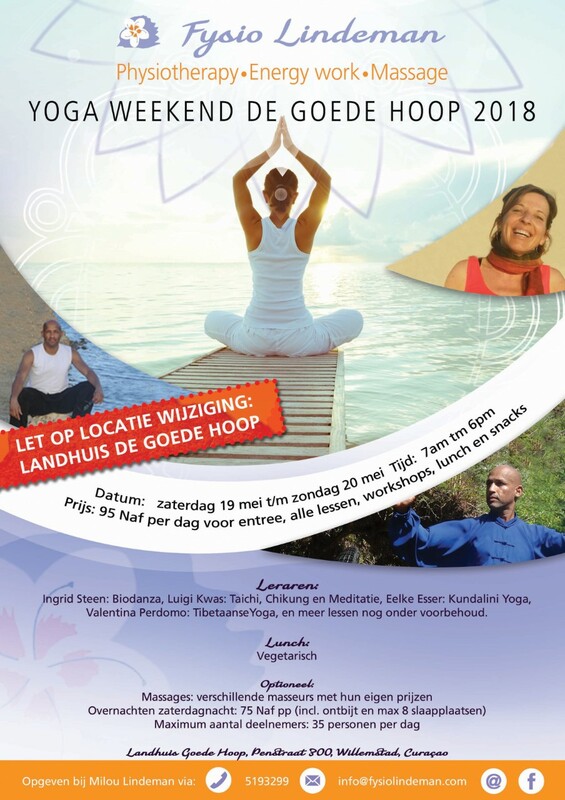 19 and 20 mei, YOGA and more!!! This is an annual event with each year a number of guest teachers from somewhere in the world that are here in Landhuis De Goede Hoop, to give their lessons with each an innovative element, it’s not only yoga, there are lots of different kind of activities, but all with the aim to uplift your body, mind and spirit. I’m Ingrid Stone, with passion, pleasure, and heartsconnection I invite you through ‘biodanza’ – which we call vivencia’s – to reconnect you, using dance, to really get in touch with yourself, with others and the world around us. Since 2009 I’m living in Rotterdam, the Netherlands. When I was living in 2007 in Cape town, South Africa, I was seized by biodanza. Dancing barefoot without prescription passes, but an invitation move and dance from inside. In the beginning I found it sometimes difficult, but soon I felt at the same time, a sense of freedom. From my own experience I can tell you that it is a great route in which inner growth automatically takes place. Mentally concepts I started to really feel and live. In daily life I feel lot more comfortable, more in contact with others. It goes a lot smoother, I feel more confidence, more inner peace, more joy, more lightness, and on the other hand, super grounded. I feel a soft strength in me, and know at the deepest level, that I am the director of my own life. With the dancers in my groups I see the most beautiful processes take place and the power of biodanza is for me still more visible. Biodanza means ‘ the dance of life’ and it is developed in the sixties by the Chilean Rolando Toro, professor, psychologist, anthropologist, poet and visionary. It is a form of dance expression. With biodanza there are no spectators and it’s not about how to look good while dancing but to be and stay in contact with yourself. The facilitator gives invitations, sometimes to dance solo, and sometimes together with a partner…and sometimes with the whole group. The first part of the vivencia is vital, the 2nd part more stillness to end again with a more vital rhythm. During the dance you don’t speak, only the facilitator talks between invitations and also sometimes she let see a dance for inspiration. You don’t have to think or analyse, in contrary, you let go of the head and get in your body. Your body knows what to do. Biodanza is being practiced nowadays all over the world. The music choice is different per vivencia and is a mix of world music, from African to South American and from pop to classical. als docent Martial Arts. Hij opent het weekend met een wandeling en meditatie bij de zee daarna geeft hij ‘s middags een workshop Taichi: bewegingen uit de vechtsport, Chi Kung : energetische oefeningen om je lichaam en organen te harmoniserenen en meditatie, waarbij je een verdieping krijgt waar je lang wat aan zult hebben. “In dance, something indescribable happens, something words cannot truly convey. It is a melting, a surrender, a happening. Something “else” takes over, something universal. As you move from the director to the spectator and become the witness, pure Presence arises. Your Body, your Being, they become One. A communion arises. As they merge, tensions, thoughts and emotions gradually slip away. The space inside expands, unifies, awakening the Self, till all that remains is Space itself. Stillness in movement. Spirit awakens. The creative fires and emotional waters fuse to create a flow of pure energy – an ocean of blazing waters. Soft yet powerful, still yet dynamic, subtle yet present. The main goal of all Indian Philosophy is to overcome misery. Daphne BodyArc has been teaching for twelve years and is known for her ability to articulate complex matter in a very clear and pragmatic way. At our festival she will talk about the Eight Paths of Yoga and how to implement them in daily life and practice. Applying these tools will set the student on the road to a more joyful and happier life! In my class I like to share with you the knowledge that was given to me by my great teacher Yogrishi Vishvketu during my stay in India. He developed a truly unique style called Classical Kundalini. Classes focus on the subtle energy systems of the body and work to balance the solar and lunar channels. A combination of asana, oscillating movements, Tantric and Vedic Bija mantras, chakra vizualisations and dynamic pranayama techniques will clear the energy passageways and the chakras, aligning you with cosmic prana. You will come away with great clarity, vitality and peace. This class is suitable only for people who are common with hatha yoga, since we will do advanced breathing techniques. To prepare for this yoga class it is important not to eat a heavy meal 2 hour before class. Straight from California. As a DJ, Shireen always found peace through music, that universal language which speaks to all of us unanimously. When she learned of Kirtan, the singing of the divine names, five years ago, she fell in love with the path of Bhakti yoga. Bhakti yoga is the yoga of devotion. By chanting the divine names, we connect to our hearts and the energy of the divine. Every word carries it’s own vibration, and through Kirtan, we raise ours. Born in Bogotá and raised in Curaçao, Valentina picked up meditation from the early age of 6. Intuitively practicing meditation practices she didn’t quite understand, she could from a very young age readily enter states of awareness for which she only much later came to understand their significance. With a background in Ashtanga Yoga, Tibetan Yoga, Tibetan Energy Healing and Tantric Buddhism, Valentina spent many years fusing the scientific with the spiritual while studying Psychology and Cognitive Neuroscience and later on working as a researcher at The University of Amsterdam. What can the Modern West and our notions of Psychology learn from the vast expanse of Buddhist and Yogic literature on the Mind and Well-Being? That was the question she sought to answer using modern neuroscientific methods and ancient Yogic ideas. After 7 years of pursuing this endeavour, like a gestalt switch, the answer became clear. Mind, in it’s true nature, is self-perfected. Nothing to learn, nothing to do. One only has to realise this very nature of mind, our true essence. In her class, she will guide you through a gentle sequence of Asana, loosening the joints (Tsigjong) and Pranayama to start waking up the body for the day. Once we’re better grounded in the physical and more open in the energetic, we step into the domain of the mental with meditation. We’ll work with mantra to start settling the mind and balancing the feminine and masculine energies within, before dropping all methods and techniques to come to rest in awareness, space itself. Afterwards there will be time for questions and discussion. Massage: We have a few massage therapists and energetic practitioners on the spot, you can ask them for a treatment when you are there, and you can pay to them, their own price. Luigi gives TuiNa, it is a manual treatment method from the Traditional Chinese medicine. TUI na has a wide variety of massage and manipulation techniques that can be applied on different parts of the body. At Tuina is pressure on the meridians and specific points, allowing the body’s own energy can flow freely and evenly by the body so that it can come back into balance. If the balance is restored then you will feel more relaxed and full of life force. In addition, it also improves the circulation of blood and body fluids through the body and trigger points are activated. Valentina and Shireen will be giving psychic readings and consultations. Cheraldine geeft holistische behandelingen en is alleen aanwezig op zaterdag! Je kan je al van tevoren aanmelden, maar ook ter plekke. Graag hou ik 15 min tussen behandelingen in, met een 30 min pauze voor de lunch.